Though I have yet to spend anything on my wedding, which is in 7 months, I've been thinking about my budget for the wedding and my regular monthly budget. 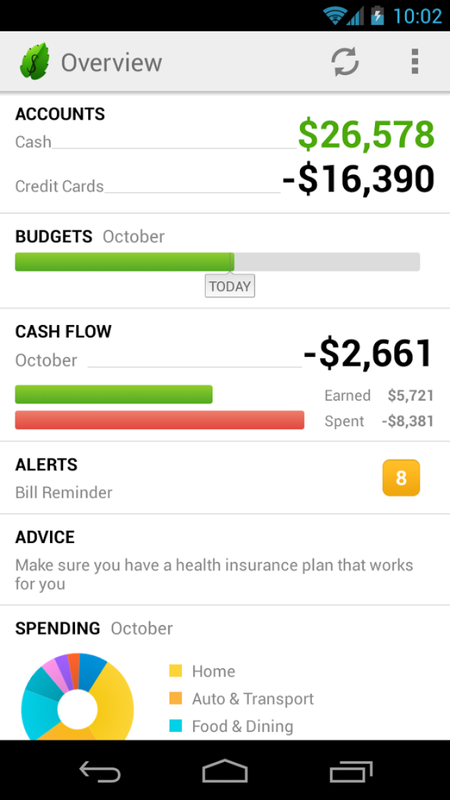 Recently, a friend told me about Mint - an app she uses on her phone for budgeting. There were a few lagging updates since I started using it but the last update worked out those glitches and the app records transactions in almost, if not, real time. Source: Mint app from google play (screenshot). Note: Not my accounts. Lol. You can make an account on the website or download the app directly and sign up via the app - it's available for both iphone and android phones. 128-bit encryption for security. Additionally, Mint is a "read only" service - no money can be moved within the app. Mint sends texts/emails for changes in account activity. Aside from some lag in previous updates, I haven't had any issues with this app/product. I've been using it for about a month now and it's a great tool for watching spending habits and staying on track with financial goals. Additionally, when I do make wedding purchases I can label the transactions as "wedding" which will create a new category of spending. I can easily track my wedding budget within my actual budget instead of having another wedding app or additional app to consult. Hooray for apps that make staying on track easier! Thoughts or comments? Feel free to post below!